In the subclavian steal syndrome, due to stenosis of the subclavian artery, blood may be supplied to the arm via retrograde flow in the vertebral artery. This causes brainstem symptoms due to low blood flow in the vertebral artery. Symptoms may be provoked by arm exercise. They may include paroxysmal vertigo, drop attacks and/or arm claudication. (Osiro et al, 2012). Symptoms may resemble Meniere's disease with dizziness, vertigo, tinnitus and hearing loss (Psillas et al, 2007). Of course, in subclavian steal, symptoms are provoked by exercise -- not the case with Meniere's disease. Occasional patients who have had coronary artery bypass graft surgery, can develop angina related to subclavian steal. (Farini et al, 2014). However, this is really a cardiology syndrome in people who are post surgery, and not a cause of dizziness. The usual method of diagnosis of subclavian steal is to notice and follow up on a large difference in blood pressure between two arms (Kilic et al, 2014). In other words, you have to think about it and check both arms. 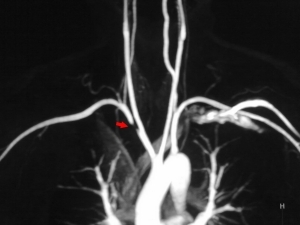 Screening can be with doppler, but CT or MR angiography is the method of diagnosis. Percutaneous angiography and stenting rather than bypass grafts is the most favored treatment approach, but some suggest that bypass grafts are more durable (Redmond et al, 2002). The vertebral arteries begin in the neck generally taking their origin from the subclavian arteries or the brachiocephalic trunk (combination of carotid and subclavian together). In the picture above, the right subclavian comes from the brachiocephalic trunk, and the left from the subclavian. They next enter the bones of the neck (vertebrae) at C5-C6, and then ascend upward through holes in the bones called "transverse foramina". Between the top 2 vertebrae, C2 and C1, the vertebral arteries move laterally. This is where they make a jog to the side on the picture above. Next they enter the skull, and eventually join together to form the basilar artery that supplies the brainstem and cerebellum. The image above is from an MRA. MRA's have the advantage that they are more "anatomic" than doppler as well as less invasive than full angiography, and involve less computer guesswork than CTA, but sometimes the images are a little sketchy. The image above is typical of a non-contrast MRA. 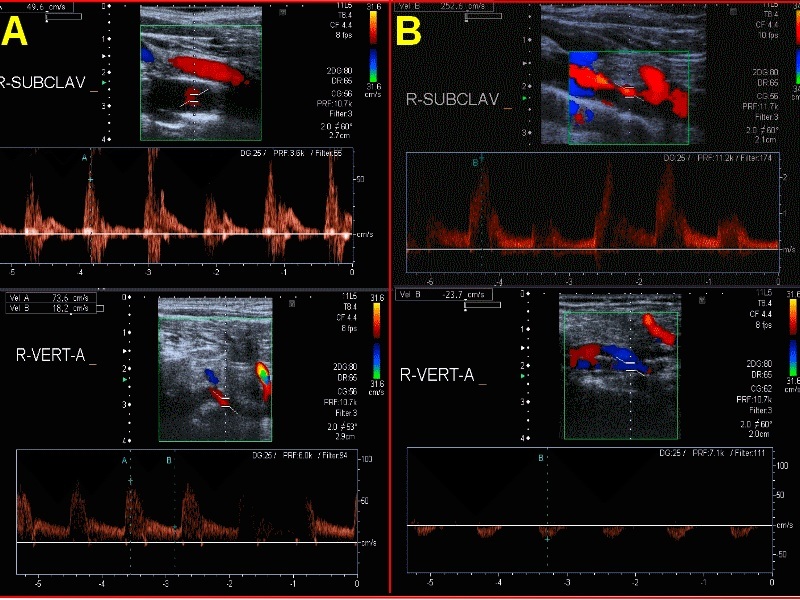 In A is a normal patient ultrasound (subclavian and Right vertebral artery) in B: sublavian stenosis patient (high velocity: 252 cm/sec) and the right vertebral artery with flow reversal. Patient B: had bilateral fluctuating hearing loss, recurrent vertigo, and asymmetry in the radial pulse and blood pressure between both sides. Fanari, Z., et al. (2014). "High-risk acute coronary syndrome in a patient with coronary subclavian steal syndrome secondary to critical subclavian artery stenosis." Case Rep Cardiol 2014: 175235. Kilic, I. D., et al. (2015). "Coronary subclavian steal syndrome: a case-based review." Herz 40(2): 250-254. Osiro, S., et al. (2012). "A review of subclavian steal syndrome with clinical correlation." Med Sci Monit 18(5): RA57-63. Psillas, G., et al. (2007). 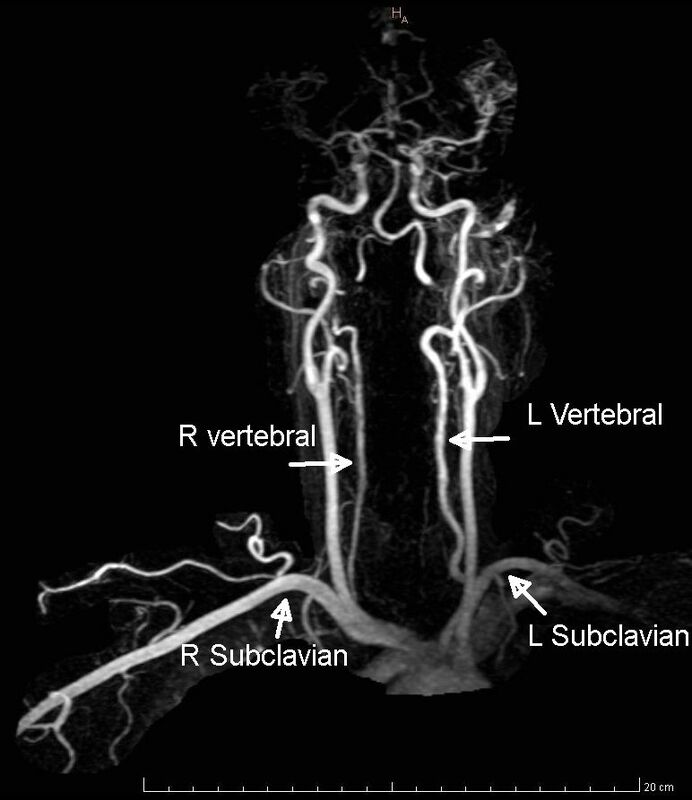 "Subclavian steal syndrome: neurotological manifestations." Acta Otorhinolaryngol Ital 27(1): 33-37. Redmond, K. C., et al. (2002). "Bilateral subclavian steal syndrome." Ir J Med Sci 171(1): 44-45.